Royal Challengers Bangalore 142- 1 (Chris Gayle 82*, Virat Kohli 36*, Pragyan Ojha 1-25) beat Mumbai Indians 141-6 (Dinesh Karthik 44, Sachin Tendulkar 24, Muttiah Muralitharan 2-24) by nine wickets. Mumbai Indians scored 141 runs for the loss of six wickets in the allocated 20 overs and Royal Challengers Bangalore plundered 142 runs with nine wickets in hand and 12 balls to spare. Chris Gayle was declared ‘Player of the match’ for his thundering innings of unbeaten 82 off just 59 balls. 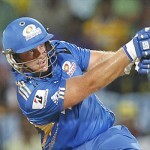 The 54th match of the Indian Premier League was played at Wankhede Stadium, Mumbai on Wednesday, May 9, 2012. Earlier, the captain of Royal Challengers Bangalore, Virat Kohli, won the toss and elected to field first. His decision paid off as Mumbai Indians lost two early wickets in 1.5 overs when Dinesh Karthik joined in with the opener, Sachin Tendulkar. They found it hard to score the runs, they managed just 10 runs in the next three overs and the score board displayed 12 runs at the end of the first five overs. Tendulkar could not swallow the tight situation and opened up by dispatching three consecutive fours in the sixth over off Vinay Kumar. He sent the second ball of the 9th over reeling over the fence but was caught and bowled by Harshal Patel on the next ball for 24 off 27 balls with 4 fours. The third wicket fell at 41 runs as Ambati Rayudu took guards in the centre and tried to establish the innings with Karthik who was adding useful runs at the other end. They added 44 runs for the fourth wicket when Rayudu was gone for 22 runs and as the score reached 100, Dinesh Karthik was caught by Kohli off Muttiah Muralitharan for 44 off 39 deliveries with one six and 3 fours. Muralitharan struck again on the very next ball by removing the adventurous Dwayne Smith for two runs. Kieron Pollard and the skipper, Harbhajan Singh, provided some stability to the score by the late order assault and accumulated 41 runs in 4.1 overs. Pollard remained unbeaten for 21 off 13 balls with two sixes and Harbhajan was at the crease at 20 off 12 deliveries with 3 fours as Mumbai Indians managed 141 runs with four wickets in hand in 20 overs. Vinay Kumar, Harshal Patel and Muttiah Muralitharan shared the honours of the bowling with two wickets each. Royal Challengers Bangalore opened the innings with their thrilling batsmen, Tillakaratne Dilshan and Chris Gayle as they compromised by scoring just eight runs in the first three overs. They geared up in the fourth over by compiling 14 runs that included a couple of fours from Gayle and one from Dilshan. Gayle carried on with the aggressive batting and hit a six over midwicket on the second ball of the sixth over from RP Singh but got a life on the very next ball when dropped by Dwayne Smith. The first wicket accumulated 48 runs in 8.3 overs as Dilshan was declared leg before wicket off Pragyan Ojha for 19. Virat Kohli came in next and Gayle plundered Ojha with three back to back sixes in the 11th over and completed his fifty as well. Kohli also joined with Gayle and found the lost touch by hitting boundaries quite often. Royal Challengers Bangalore required 16 runs to win the match in 18 balls which was achieved on the last ball of the 18th over with a six from each batsman. Chris Gayle butchered the bowling and was unbeaten for 82 off 59 balls with 6 towering sixes and 5 fours whereas Kohli held his end with 36 from 25 deliveries which comprised 2 sixes and a four. Mumbai Indians – 14 from 12 games at a net run rate of -0.198. Royal Challengers Bangalore – 13 from 12 games at a net run rate of -0.223.
zia its good effort the language n writing is very mature keep it up. keep patronising and I will do my best to put our website on top.